N Male On RG400 To N Male Connectors 50ohm FEP Jacket Coaxial Cable Assembly. Using M17/128-RG400 Double Shield Cable. An impedance of 50ohm is highlighted in the Field Components N Male RG400 Cable Assemblies. The NM to NM is constructed using RG400 cable. 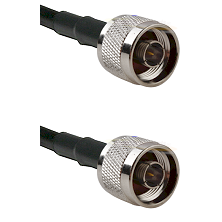 The N Male RG400 Cable Assemblies NM-RG400-NM-Length are precision manufactured using highest quality RF and Microwave coaxial connectors.